CoC developed by Supercell firm is a strategy based online multiplayer game. This game starts with an in depth tutorial where you as a chief of the village is taken through the tutorial. In this game, you have to basically set up your own village. Town Hall is the heart of your village and you have to defend it against enemy attacks and raids. By upgrading your town hall, you unlock different defenses and troops. Setting up right defenses at the right place is very important while defending your village against other players. Gold and Elixir – All that Matters! It comes down to gold and elixir to master this highly addictive game. 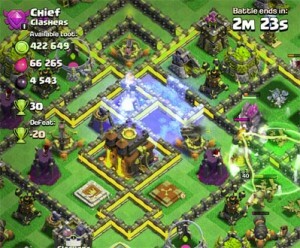 With gold and elixir, you can not only buy defense and other building but you can even upgrade your troops and defense. So, ultimately you need both gold and elixir to survive in this game. There’s one laboratory where you can put your troops on upgrades. You get 2 builders when you start the game for the first time. Builders are used for upgrading buildings and defense. So, having free builders is MUST. You can purchase more builders by spending gems and if you run out of gems you can spend some bucks and purchase gems through in-app purchase option. The most exciting part of this game is clan wars. First thing fist, you need to either make a clan or join some clan to be a part of clan wars. This feature allows you to fight against other clans. You can have a war of at least 10 vs 10 and maximum of 50 vs 50. The more player you the more exciting it get. And if you manage to win the war you get huge amount gold and elixir as war bonus. Exciting, thrilling and addictive! Took me 2 hours to write this because after every few minutes I was checking my village or going for some loot attacks. You will love it!